Morus nigra, called black mulberry or blackberry (not to be confused with the blackberries which are various species of Rubus), is a species of flowering plant in the family Moraceae, native to southwestern Asia, where it has been cultivated for so long that its precise natural range is unknown. It is known for its large number of chromosomes, 308 (44x ploidy) . Other mulberry species are sometimes confused with black mulberry, particularly black-fruited individuals of the white mulberry, but black mulberry can be distinguished by the uniformly hairy lower leaf surface. Morus nigra is a deciduous tree growing to 12 m (39 ft) tall by 15 m (49 ft) broad. The leaves are 10–20 cm (4–8 in) long by 6–10 cm (2–4 in) broad - up to 23 cm (9 in) long on vigorous shoots, downy on the underside, the upper surface rough with very short, stiff hairs. The edible fruit is dark purple, almost black, when ripe, 2–3 centimetres (0.8–1.2 in) long, a compound cluster of several small drupes; it is richly flavoured, similar to the red mulberry (Morus rubra) but unlike the more insipid fruit of the white mulberry (Morus alba). Black mulberry has long been cultivated for its edible fruit and is planted and often naturalised west across much of Europe, including Ukraine, and east into China. Black (Morus nigra) mulberries are thought to have originated in the mountainous areas of Mesopotamia and Persia and are now widespread throughout Afghanistan, Iraq, Iran, India, Pakistan, Syria, Lebanon, Jordan, Palestine, and Turkey, where the tree and the fruit are known by the Persian-derived names toot (mulberry) or shahtoot (شاه توت) (king's or "superior" mulberry), or, in Arabic, shajarat tukki. Jams and sherbets are often made from the fruit in this region. 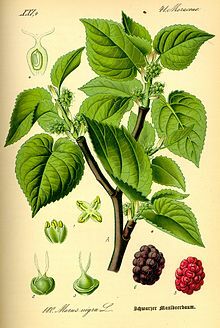 The black mulberry was imported into Britain in the 17th century in the hope that it would be useful in the cultivation of silkworms (Bombyx mori). It was unsuccessful because silkworms prefer the white mulberry but has left a legacy of large and old trees in many country house gardens. The largest documented local concentration of black mulberries in Europe (470 trees) can be found in the vineyards of Pukanec in Slovakia. Ripe fruit and foliage of Morus nigra. A centuries-old tree of Morus nigra. An old black mulberry tree in spring. ^ "Morus nigra". Germplasm Resources Information Network (GRIN). Agricultural Research Service (ARS), United States Department of Agriculture (USDA). Retrieved 21 December 2017. ^ "Definition And Classification Of Commodities (Draft) 8. Fruits And Derived Products". Food and Agriculture Organization of the United Nations. Retrieved 1 August 2014. ^ Zeng, Q; Chen, H (2015). "Definition of Eight Mulberry Species in the Genus Morus by Internal Transcribed Spacer-Based Phylogeny". PLoS ONE. 10 (8): e0135411. doi:10.1371/journal.pone.0135411. PMC 4534381. PMID 26266951. ^ Nelson, G.; Earle, C.J. ; Spellenberg, R.; More, D.; Hughes, A.K. (2014). Trees of Eastern North America. Princeton University Press. p. 408. ISBN 9781400852994. ^ Kristbergsson, K.; Ötles, S. (2016). Functional Properties of Traditional Foods. Springer. p. 211. ISBN 9781489976628. Wikimedia Commons has media related to Black Mulberry. This page was last edited on 3 April 2019, at 03:31 (UTC).